These Slime Smart Spare Emergency Tire Repair kits are the smart way to repair a flat tire. There's no need to jack-up the car or remove the wheel. 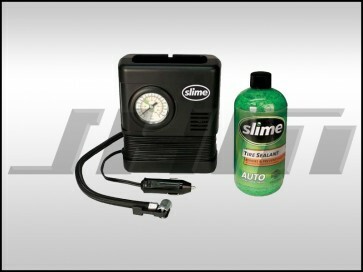 You just install Slime tire sealant, re-inflate your tire with the included compressor, and go. This kit is PERFECT for customer's upgrading to our JHM Lightweight Battery Relocation Kit and are looking for a spare tire solution.